Here is a good way to keep an eye on what your children are doing on the web. Control the websites they can visit and stop them surfing into the night with Family Safety settings. 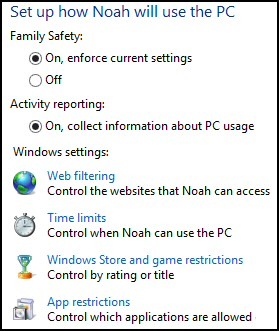 In Windows 7 and Vista this feature was know as Parental Controls; here in Windows 8 its metaporhosised into Family Safety; not only is it easier to setup but you can also manage the settings online. To get started either navigate to the Control Panel and then User Accounts, or else type 'F a m i l y' at the Metro UI. It's safest to only allow the young user access to a few sites, then add other suitable urls as your child wishes to roam further afield. The danger of allowing all except certain sites, is that you can never keep up with the new inappropriate sites coming online each week. In addition to creating a curfew for computer usage, in Windows 8 you can set absolute time limits for computer activity each day of the week. It makes sense to block games with no ratings. Decide which programs the child can use locally on the computer. You can review the user's activity both online and when logged on to their PC(s). Launch the Control Panel and select Family Safety. Choose the user, then click on the link: 'View activity reports', see screenshot to the right. I was most impressed with the comprehensive report of the child's activity. From their time usage, through to the websites they were trying to access. 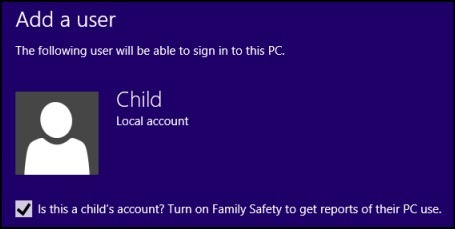 Note: You cannot setup Family Safety for administrative accounts, as I found when I attempted to use Family Safety as a way of checking on my own account's time usage. For at least two generation's children's physical ability to roam has been severely restricted by most parents. For example in 1957, there were no parents of my 3rd grade class outside the school gate when we went home. My point is that the internet has become the new frontier for children to roam. There is a body of opinion which says, that while children under 13 ish should be restricted and monitored completely. However, there comes a time when you have to trust them to hang out with their friends on the internet. My own feeling is to allow a relatively large amount of trust, but apply as much monitoring as possible, so that I know what's going on. As usual, Microsoft provide numerous options, such as the child can request permission to view more websites or download additional apps. In conclusion you should be able to tune Family Safety to suit your parenting standards. However, the truth is that social engineering such as talking to other parents or your children's friends is the best way of uncovering the latest ruses for working around the parental controls. The quickest way to start is by pressing WinKey +i. Select 'Change PC Settings' at the bottom of the screen. For a child's account I suggest scrolling down and select: 'Sign in without a Microsoft account'. Remember it's a Local account. Fill in their name and password. [Key point] Tick the box: 'Is this a child's account?'. 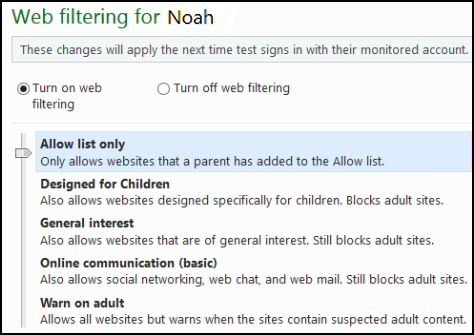 This feature has improved since it was called Parental Controls in Vista. You may be pleasantly surprised in the breadth of computer usage that you can restrict and monitor with Windows 8's Family Safety.